Scenes from last year's Christmas Market. The Christmas Market at Market Square Kilcullen planned for 8 December is fully booked, writes Antoinette Buckley of the Christmas Market Committee. The committee are absolutely delighted to organise this very successful event again this year for the town. It really worked so well last Christmas, businesses reported great business on the day and follow-up business in the lead up to the busy Christmas shopping period. We decided to test out a Christmas Market last year to help support the local businesses in Kilcullen and to increase footfall into the town on the day. Shop Local Campaign posters were put up on the bridge poles to get the message out. 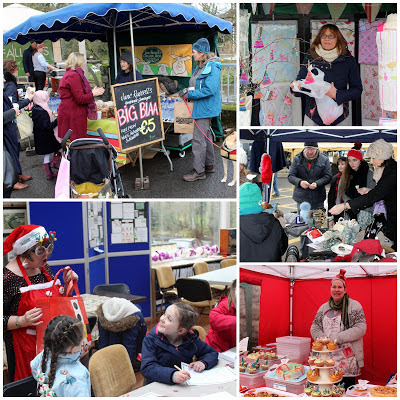 Due to the success of the event businesses asked if we would consider an Easter Market. We were happy to go ahead with that and again it proved to be a very good day for all. This year we have great local stalls lined up. Those offering food include Crean's, Fallons, the River Cafe, Kalbarri Cookery School, Armelle's, Nolans Butchers, the Hideout, and Jane Russell sausages. Other attractions and seasonal buying opportunities will be provided by Woodbine Books, the Secret Kloset Boutique, and stalls selling fresh Christmas trees, flowers, memory boards, crafts, personalised Christmas decorations, hand made jewellery, artwork, lanterns, handmade knits and crochet, Christmas wreaths, Markus landscape gifts, Camphill organic foods, preserves, mince pies, Christmas cakes, choc biscuit pudding, mulled wine, and Christmas gift sets. There will be a face painter, and DJ Georgia will entertain with festive music on the day. KCA are buying new Christmas lights for the bridge and for the tree on the river at Market Square. A large Christmas tree and three smaller Christmas trees with lights will be put up in the flower bed on Market Square. Thanks to KCA for their support. This year we will have a Santa's Grotto in the Heritage Centre from 12 noon to 5pm, with Berney's Pharmacy sponsoring the Santa gifts on the day. Photographer Conor Williams will offer a photo with Santa service. The official switch-on of the Christmas lights will take place at 5pm on the day by KCA (Kilcullen Community Action). The Kilcullen Gospel Choir will perform some festive songs between 4pm-5pm before the switch on. Looking forward to a fun, happy, festive Christmas Market 2018 at Kilcullen Market Square. Shop Local, Support Local this Christmas.